Is Claude Giroux Poised to Become the Next Flyers Captain? Almost six years ago Bob Clarke forgot the name of the Philadelphia Flyers’ 22nd overall pick in the 2006 NHL Entry Draft. That pick, a small 18-year-old by the name of Claude Giroux, had to wait for his chance to prove he was a NHL-caliber player but now as one of the league’s best players, Giroux is making sure his name is never forgotten again. Greatness doesn’t come in January during a typical bout against a divisional foe, but rather when the calendar brings about the warm weather. It’s difficult to teach greatness, or leadership for that matter – a player either has it or he doesn’t. Over the years, the two and a half month event has helped separate the good from the great. Great is a term that is thrown around way too often by today’s fans and media but during the Flyers’ chaotic first round win over the Pittsburgh Penguins, that’s exactly what Giroux was – great. While he failed to register a single point in Game 1 of the series, over the next five games Giroux had six goals and eight assists, finishing with 14 points, which is the second most ever by a Flyers player in a postseason series, behind only Tim Kerr who had 15, also against the Penguins, in 1989. It was the type of series that one came to expect from Wayne Gretzky or Mario Lemieux, a performance that happens once, maybe twice a decade. Giroux leads the postseason in points, goals, assists and plus-minus, but he brought a lot more to the orange and black than those numbers would indicate. And it wasn’t more noticeable than in the series-clinching Game 6. Giroux went up to coach Peter Laviolette before the opening faceoff with one simple demand. “When the best player in the world comes up to you and tells you, ‘I don’t know who you’re planning on starting tonight, but I want that first shift,’ that says everything you need to know about Claude Giroux right there,” Laviolette said after the win. And he didn’t let his coach down. Giroux came out like a man possessed, laying out Sidney Crosby with a big hit, before scoring the game’s opening goal, just 32 seconds in. As he celebrated by the glass, he shouted to the fans and players alike in the hopes of getting them even more amped up. It set the tone for the rest of the game and has already become a part of Philadelphia sports lore. Giroux’s heart and determination was a breath of fresh air for a team that has struggled to find leadership over the last few seasons. His selfless style of play has left many wondering if Giroux is ready to step up and wear the “C” in case current captain Chris Pronger is forced to call it a career. The captain position has been a revolving door for the Flyers since the lockout during the 2004-2005 season, unlike many of the NHL’s powerhouse teams. There have been six captains (Keith Primeau, Derian Hatcher, Peter Forsberg, Jason Smith, Mike Richards and Pronger) who have lead the orange and black during that eight year span. It has seemingly become an epidemic much like the team’s two decade-old goaltending woes. The Flyers appeared to have the “C” locked up for almost a decade, when the team gave Richards the letter in 2008 but the player often referred to as “Bobby Clarke Light” clearly lacked the leadership skills and seemed more worried about life off the ice, rather than on it – perhaps a big reason why he was traded to Los Angeles this past summer. If Pronger is forced to retire due to his ongoing concussion symptoms, there is certainly no shortage of guys who could become the captain for Philadelphia. Beside Giroux, the best options as captain would be Danny Briere or Kimmo Timonen but given the fact that both are getting long in the tooth – not to mention their current contracts are almost up – it seems unlikely that the team would want another short term captain. 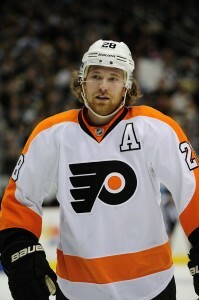 Giroux, who currently wears an “A”, practically proved in one playoff series that he will be the heart and soul of this team for many seasons to come. There is plenty of time to worry about the captaincy during the offseason but for now there is only one thing on Giroux’s and everyone else’s mind – hoisting the Stanley Cup!